Wednesday in the NBA brings us four games of playoff action with two teams on the verge of advancing to the next round. Jazz and Rockets will look to close out their respective series. Meanwhile, we have a couple of other matchups tied at two games apiece. Intrigue abounds on this slate and there are plenty of ways to take your lineups. 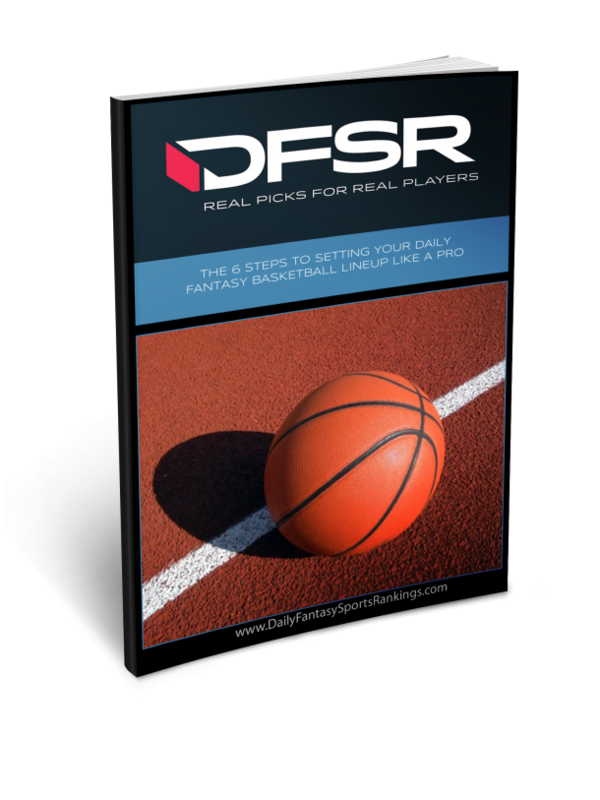 Now’s your chance to get DFSR PRO, which will give you access to our NBA and MLB optimizer and our new player lab! Get started for free by clicking the button below. First time with NBA or MLB? 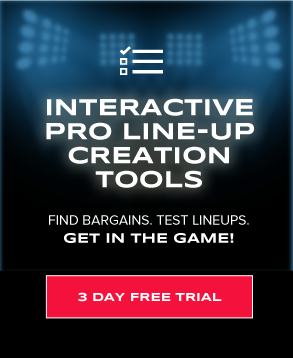 Be sure to read our free MLB Ebooks on building lineups, general strategy and more. We've got you completely covered. The entire city of Toronto might have a collective freak out if the Raptors somehow drop this Game 5 at home. After jumping out to an early 2-0 series lead, Toronto promptly dropped Games 3 and 4 in Washington. With the series shifting back, things feel anything but safe for the East’s number one seed. I’m not as bullish on the cash game viability of Kyle Lowry (FD $8300 DK $7800) and DeMar DeRozan (FD $8600 DK $8300) as I was at the beginning of the series. They’ve both seen rather dramatic price increases since Game 1 and there are better values going on Wednesday. I find it tough to trust really anyone else on the Raptors. They are still playing bench guys enough minutes to cut into the starters without expressly being value plays themselves. This series has basically come down to which of the guard duos will outplay the other. In Games 3 and 4, John Wall (FD $10700 DK $10500) and Bradley Beal (FD $7800 DK $7600) with the former averaging 28 points and 14 assists, the latter 30 points and five rebounds. Like the Toronto guards, these guys are likely priced a little too high for cash games. In the realm of cheap center plays, Marcin Gortat (FD $4100 DK $4400) still rates. Outside of a disaster Game 2, he’s averaged 13 points and five rebounds. That’s fine enough for these short slates at his prices. The center position is a weaker one and I’m fine getting away from it on the cheap if possible. At this point, I really don’t see any reason to fade LeBron James (FD $11800 DK $12000) in cash games, even with limited cheaper options. For this series, he’s averaging 33 points, 12 rebounds, eight assists, a steal and a block in four games. He’s just dominated from a fantasy perspective and the way the Cavs need every single one of his minutes, it’s hard to imagine him not playing a boatload again on Wednesday. He only sat out two of the 48 minutes in Game 4 and I expect something similar in this one. The problem with the Cavs is what to do with them after James. J.R. Smith (FD $3600 DK $4400) and Kyle Korver (FD $4300 DK $4300) have some upside at their prices if the three ball is falling, but that’s very tough to trust. Kevin Love looks like his hand is giving him issues and he was terrible last game. I don’t trust him right now. Victor Oladipo (FD $9200 DK $8100) is one of the upper middle tier guys on this slate that really makes things interesting when constructing lineups. Of course, we can’t just roster all of the most expensive players and call it a day. There has to be a cutoff point somewhere. I will say Oladipo probably has the highest floor of anyone in this price range. The Cavaliers remain bad on defense and his usage rate has him shooting shots in the 20s if he’s on the court enough. Myles Turner (FD $5800 DK $5100) got in foul trouble in Game 4, but I think he’s still a value on both sites. The Cavs have had issues with him in this series and he’s scored more than 15 points in three of the four games. The Rockets used a 50 point third quarter to pull ahead and basically step on the neck of the Timberwolves who played a feisty first half and looked poised to really give Houston a run for their money. But alas, Harden and company went into cheat code mode and simply couldn’t miss for the 12 minutes out of halftime. This is what Houston can do to you: they rain down a barrage of three-pointers, get a little stingy on defense and all of a sudden you are backpedaling into oblivion. The Rockets doubled up the Timberwolves in threes (43 to 22) and when they’re going in at around the same clip (36%) it’s just too much for most teams. Now they’ll look to close out Minny at home in Game 5. The James Harden (FD $11800 DK $10900) in cash play was looking awfully iffy until the third quarter, but he finished with 36 points, three assists, and four rebounds. The dimes were on the low end, but everything else (including four steals) helped him creep toward value. He’s an excellent play on this slate again though if choosing between him and Lebron for the big money, I’ll go the latter. Clint Capela (FD $8200 DK $7300) remains one of the playoff’s best values and produced again in Game 4 with a 14 point, 17 rebound line. The Rockets, with the lead, were happy play him in crunch time to deal with the Minnesota bigs. Chris Paul (FD $8900 DK $8200) and Harden’s production is often mutually exclusive which was why a nice night out the former, coupled with Harden’s scoring, was a nice surprise. Look, if you think these minutes keep up for Derrick Rose (FD $4000 DK $4600), then it’s tough to avoid him in cash at his current salaries. Jeff Teague had some injury stuff in Game 4, so I can’t imagine Rose plays another 30+ minutes. But the ex MVP has at least looked spry. He was +6 while on the court and finished as the value of the night on Monday with 17 points, six rebounds, and four assists. I suspect he has higher ownership on this slate with “punt” plays though to come by. I still think Jimmy Butler (FD $8400 DK $7900) provides an adequate floor considering his minutes, but I am a little worried the Rockets just blow the doors off Minnesota in this game. If it stays close, he should see minutes easily in the lower 40s as there’s no reason to save anyone in an elimination game. The Jazz won Game 4 in fairly convincing fashion and now are on their way to possibly closing out this series in Game 5. The Jazz continue just running their sets, staying at a slower pace and clogging the lane on defense to limit Westbrook’s main source of scoring. This game, for a lot of reasons, is the least interesting from a fantasy perspective. Both teams are still playing at very slow paces and the defense going both ways excellent. Russell Westbrook (FD $10600 DK $10600) is coming cheaper than some of the other top money plays, and you have to believe he’s going to play just about every minute in a close game, but since Game 1 he’s struggled to reach value at these prices. Paul George (FD $8100 DK $8000) is somewhat interesting, but I’d rather play about four other guys in this price range. The Jazz have rendered Steven Adams almost useless and I suppose you can play Carmelo Anthony on the cheaper side of things. As for the Jazz, playoff Ricky Rubio (FD $7400 DK $7500) came back down to Earth some in Game 4 when he took his fewest shots of the series. The story was Donovan Mitchell (FD $8600 DK $8400) with 33 points, seven rebounds and four assists, but I’d rather play Oladipo in the same price range at shooting guard. The one solid DraftKings play is Rudy Gobert (FD $8000 DK $7000) who gets the extra bonus for being a double-double threat. He’s a cash game play for sure.